Abednego and his half-brother Joshua both live at the orphanage. They have different fathers and lived separately as young children. When Joshua was brought to the orphanage he told Patrick about his brother and Patrick went in search of Abednego. He found him in Asuokyene village living with his father in a community farm house in poor conditions. His mother Cecilia had left the family to go travel and is currently a dish cleaner in Tema. Abednego and his father, Samuel, did not want to separate but simply could not afford to live in Asuokyene on his farmers salary. Patrick offered Samuel a job as a security guard so they both came and lived at the orphanage together but recently Samuel got a house alone in Lemtuy, a neighboring town to Kasoa. 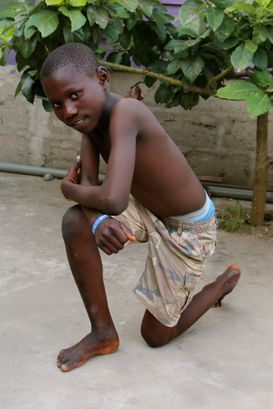 Abednego still stays at the orphanage with his brother and he can see his father each day. He can also take advantage of the huge play area to practice his football skills with his best friend Elijah and gets plenty of his favourite food, fried rice. When Abednego grows up he wants to be a soldier. Patrick has been in touch with Cecelia and she has visited the orphanage four times. The first time she visit she wept the entire time.